Creating the history in the forces, a batch of three India women fighter pilots were inducted in the Air Force Fighter Squadron. If we remember, Air Chief Marshal Arup Raha had earlier declared on the occasion of Women’s Day, that India will get its first batch of women fighter pilots on June 18. This morning Defence Minister, Manohar Parrikar formally commissioned the women fighter pilots along with flight cadets of various branches of IAF at a combined graduation parade held at Air Force Academy in Dundigal. 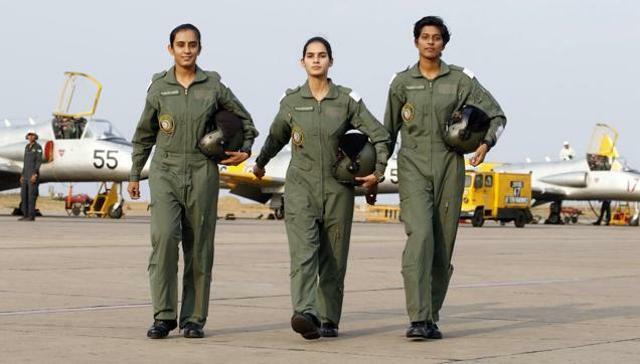 The three young women are in 20’s, Avani Chaturvedi of Madhya Pradesh, Mohana Singh of Rajasthan and Bhawana Kanth of Bihar has cleared their first stage of training and has about 150 hours of flying. And once they clear the Combined Graduation Parade Spring Term 2016, the flying officers from Sunday will be trained for six months on advanced Jet Fighter- British built Hawks at Bidar in Karnataka. On successful completion of III stage training at Bidar, these officers will get a chance to fly fighter jets like Sukhoi and Tejas. Avani Chaturvedi: Born in Santa, Madhya Pradesh, Avani was greatly inspired by her brother who is in the Army. Her father is an executive engineer at the state government. She did her schooling from Adarsh School in Rewa and Btech from Banasthali University, Jaipur and her interests towards flying made her join the Flying Club in college. Mohana Singh: Born in Jhunjhunu, Rajasthan, Mohana was inspired by her family who has been working for armed forces of the nation. Her grandfather was a Flight Gunner in the Aviation Research Centre and father who is a Warrant Officer in the IAF. Mohana Singh did her schooling from Air Force School, New Delhi. She then joined BTech in Electronics & Communication from Global Institute of Management and Emerging Technologies, Amritsar. “Joining the Indian Air Force for flying was a dream instilled by parents and grandparents,” said Ms. Mohana Singh. Bhawana Kanth: A girl who is born and brought up in Begusarai, Bihar is a daughter of an officer in the Indian Oil Corporation. Bhawana did her schooling in Refinery DAV Public school and BE in Medical Electronics from BMS College of Engineering, Bangalore. She was always interested in flying planes right from her childhood, which made her opt fighter stream after Stage I training. Well, achievement of these three young women is a milestone in the Indian military forces, which has permitted women into combat roles for the first time. In February, President Pranab Mukherjee had announced regarding the women entering into combat roles in near future.